Trainer Connections is the holder of a Financial Services Licence. Stringent conditions are imposed on company’s fortunate enough to have met all of the criteria to obtain a licence through the Australian Securities and Investment Commission (ASIC). One of the beneﬁts offered by TC to Trainers is the ability for them to use this licence to advertise horses that they would like to syndicate. 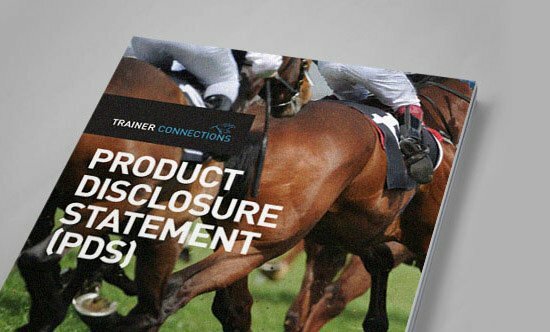 TC has available a legally prepared Product Disclosure Statement (PDS) which is made available to its Trainers in order for them to go to the marketplace and publically advertise shares in their horse. This service is provided free of charge to Trainers, saving them up to $3,000 in the cost of having a PDS prepared. On top of this, TC will work with a Trainer to sell shares, register the syndicate and ensure that all of the requirements of the Governing Racing Body in each State are adhered to. TC will then manage the monthly ﬁnancial affairs of the syndicate on the Trainer’s behalf at no cost to the Trainer. Why is a PDS so important? A Product Disclosure Statement (PDS) is a legally binding document that outlines all the ‘terms and conditions’ involved in horse ownership. It also highlights trainer commitment, a vet certificate and breeding history so you can make an informed decision when purchasing your share in a horse. It is highly recommended not to proceed in horse ownership without a PDS. Trainer Connections (TC) was established to provide administrative, payroll and marketing support to trainers of all levels, particularly those who are finding the burden of the complete business package beyond their endurance limits.